There’s no better way for a DJ or band to add instant excitement and drama to their act than to perform in front of a “curtain of moving lights” chasing to the music. Now any mobile DJ or group can drape a professional-looking chasing light backdrop behind their booth or stage area, thanks to the new, affordable LED Curtain from American DJ. A black nylon curtain with more than 100 lights that flicker to the beat of the music, the LED Curtain is economically priced, because it utilizes LEDs (Light Emitting Diodes) as its illumination source. LEDs are known for producing extremely sharp, brilliant points of light, yet they are much less costly than fiber optics, which were used in most light curtains in the past. “Until now, chasing light curtains were often out of the reach of the average mobile DJ or group, because they produced their illumination with expensive fiber optics,” said Scott Davies, General Manager of the American DJ Group of Companies. 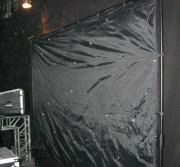 “But because our new LED Curtain utilizes LEDs, it sells for about one-third the price of a typical fiber optic curtain. Regardless of where it’s used, the LED Curtain will make an immediate impression of star power, with its multitude of brilliant LEDs. Set against the curtain’s black background, the LEDs look like twinkling stars in a galaxy. They flicker and chase, creating patterns that move in sync with the music. The movement of the lights is operated by a chase controller that comes with the LED Curtain system. The lights can be set to operate in 3 modes: All Lights On; Sound Active (moving to the music); or Chase (moving to built-in programs). The controller can also be used to select programs and control speed and music sensitivity (when in Sound Active mode). Designed for easy set-up and portability, the LED Curtain comes packaged as a complete turnkey system. In addition to the curtain and controller, it includes a tripod stand system consisting of two tripods and a crossbar, along with a carrying bag. The entire assembled system measures 123”W x 82”H. The nylon curtain itself measures 115”W x 80”H, providing a generous-sized backdrop for DJs and musical acts. When folded in the carrying bag, the system shrinks down to a compact 54”L x 11”W x 8.5”H, with a weight of 40 lbs. The LED Curtain system is available in two models: the WLED Curtain with all white LED lights; and the MCLED Curtain with multi-color LED lights in red, yellow, green and blue. Each system includes: curtain, controller, two tripod stands, cross bar, and carrying bag. The suggested retail price of the WLED Curtain is $599.95. The suggested retail price of the MCLED Curtain is also $599.95.